Soak the noodles in hot water for 15 to 20 minutes to make them soft. Drain well. Removed the head of the shrimps and deveined them. Now cook the shrimp in a little oil and keep aside. Again pour little oil in the pan and add noodles, chili sauce, fish sauce, ketchup, vinegar, and sugar. Mix the noodles with sauce until almost done. Now mix all the ingredients together (Save little bean sprout, green onion, and ground peanut). Cook briefly and remove from the heat. 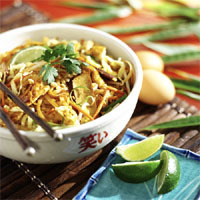 Garnish with bean sprouts, green onion, cilantro, ground peanuts, and lime wedge.